Firefighters monitor a back fire as they battle the Medocino Complex Fire on August 7, 2018 near Lodoga, California. Wildfires are ravaging hundreds of thousands of acres of the western United States and Canada this summer, taking lives and homes in California, closing parts of Yosemite National Park to visitors and racing through forests and grasslands in Idaho, Washington, Oregon, Utah, Colorado and British Columbia. Smoke from those fires is causing breathing difficulties as far away as Maine. 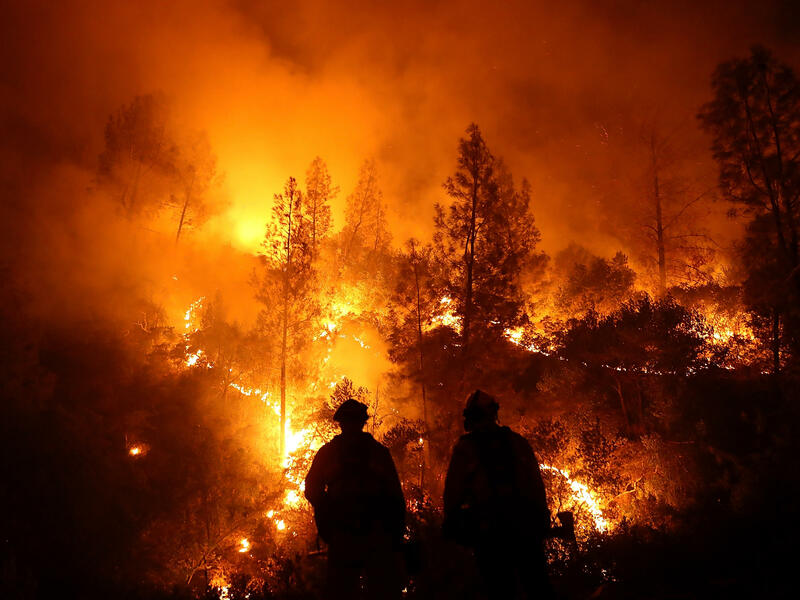 The fires have generated many human-scale stories that need telling: how residents of the city of Redding, Calif., are coping; the toll on firefighters; where low-income workers will go if their homes are destroyed by the Mendocino Complex Fire, now the state's largest-ever. NPR has told those stories and many more — and it has by and large told them well. What NPR hasn't done is use the words "climate change" in each and every one of these reports on the fires. Should it? Extreme weather events these days often trigger extreme reactions from listeners, such as the recent emailer who went so far as to argue that, because NPR did not mention "climate change" in a four-minute interview with Redding Mayor Kristen Schreder, it had joined the ranks of "climate deniers." I have no idea whether the mayor is a knowledgeable expert about climate change. But I believe NPR was right to focus its questions on her more pressing problems, including managing some 38,000 evacuees. Moreover, to be clear, NPR has reported deeply and regularly about how climate change is making extreme weather events more frequent and more severe. The question is whether, as some believe, NPR should do more. "I'm not asking for NPR to significantly shift the focus of this type of story, or to interview a half dozen scientists alongside anyone whose home has burned down. But I do think it's important to mention climate change — and its potential to exacerbate these events — as part of the context for these stories. Reporters generally seem comfortable adding political, cultural, technological, and cultural context to specific stories they report on — why is climate science treated so differently? NPR does periodically produce high-quality content focused specifically on climate change and its effects. But I think you do your listeners a disservice by maintaining so much distance between 'stories about climate' and 'stories about weather.' Listeners who are already focused on the issue of climate change are likely to make this connection themselves and seek out climate-focused content when they want more context, but if NPR's goal is to offer the best possible information to the broadest possible audience that link needs to made explicit." I asked Science Editor Geoff Brumfiel about this. "These are disasters that are affecting people's lives, and they are happening in the moment," he told me, adding, "If we're talking about someone's home and we're talking about community, I think it's reasonable that the reporter on the ground in that moment is focused on that community." Moreover, he said, the reporters that NPR assigns to these stories have varying backgrounds; some are from the Science Desk, some are from the National Desk (or other sections, or member stations). Not all report on climate change-related beats. "Reporters want to report on what they know. They can see what's burning and what's not, they can see who's in trouble, and they want to talk about that," Brumfiel said. But there is also another major factor when a hurricane hits or a fire erupts, he said: The science isn't always clear from the very first moments of an extreme weather event. "There's no reluctance to talk about climate change," Brumfiel said. "But we have to call up scientists and ask them, because climate change is a complicated thing. We can't just be off the cuff. We need to make sure we understand what the factors are, what is and what isn't happening due to climate change, because there have always been wildfires, there have always been hurricanes." Long-term weather patterns are clearly being affected by climate change, but at the level of an individual fire, say, other elements could be more important — such as the U.S. Forest Service's decades-long policy of suppressing fires instead of letting some burn for the health of the forests. "The biggest scale climate predictions work pretty well," Brumfiel said. "As you try to get to individual events, it gets more and more complicated, and climate change becomes more of a factor. It can be a driver, but it's more of a factor." All that said, Brumfiel told me he and others have been looking for some time into whether there is language guidance that can be shared with the NPR newsroom that would help it acknowledge climate change in more of the reporting about natural disasters. But, "it's complicated," for the reason he cited earlier: "Climate change can do different things. It can make weather events more frequent; it can make them more severe. And it can do different things for different kinds of events." He said: Trying to choose language that communicates all that in a brief phrase — radio journalists have limited time, after all, particularly in the newscasts that lead each hour — and "that is accurate and flexible enough that we can issue it as guidance to everybody and it won't be wrong when they use it, is tough. I honestly don't know if there is something that we can have out there that everyone can just grab and use if they want. But it is something we're thinking seriously about." I have mixed feelings about this issue. Climate change is a crucially important issue of our time and NPR should make clear when extreme weather events are connected to, or influenced by, long-term climate trends. I understand why advocates and others who are passionate about this issue want the connection to be explicit and constant, to keep it front and center in the public discourse. But, if boilerplate language can't communicate all the complexities, then I think the newsroom is right to report in-depth on the connections that do exist, in discrete stories where there is more time, rather than toss off one-liners just for the sake of mentioning the issue. NPR's job is to provide more nuance, not less, whenever possible. NPR has reported in-depth repeatedly in its current fire coverage, including in this story talking to scientists and this one, in an interview with California Gov. Jerry Brown, and in a piece examining why today's fires are hotter and more destructive. On Point (which is distributed by NPR, although not produced by it) devoted an hour to the topic. In short, there is no hint that NPR is avoiding the story of climate change. And there is more coverage to come. NPR next week will start rolling out newsmagazine, newscast and digital stories on the theme of "living with fire," looking at everything from the effects of long-term smoke exposure to what a "good fire" looks like from the point of view of fire ecologists. Western Bureau Chief and Senior Editor Jason DeRose, who is coordinating the stories, said some, but probably not all, will discuss the role of climate change. But, he said, when NPR's fire coverage is looked at in its totality, "It's very clear that we are reporting on this in the context of climate change." Finally, I'll give Brumfiel the opportunity for a plug. He and Jennifer Ludden — who leads NPR's energy and environment team that works in collaboration with member stations — have developed a strategic approach for climate change coverage, tackling stories that are not as attention-grabbing as a fire or hurricane, but just as important. The series, called "Heat," has been running through the summer; all of the reporting can be found here. It includes reports on how heat is affecting Michigan apple growers and throwing Colorado ecosystems out of whack, and how Maryland farmers are losing land to rising sea levels. Brumfiel said: "We're trying to really tell the stories on the ground that are happening to Americans right now. And often those stories aren't natural disasters. It is stuff that is happening on a smaller scale every day; local disasters, I guess you could call them, that are really changing America. Climate is changing all sorts of different aspects of our lives." Meanwhile, we'll update this column if the newsroom comes to a decision on language about climate change that would work for more news stories.